Full Description: SOLD - Unique Opportunity to Purchase a Historic Period Property, Late 1800s, Full of Character and set in a Secluded Rural Location. Former Station House Positioned by the Manx Steam Railway. Interesting property consisting of a former station house converted into a luxurious four bedroom character home. 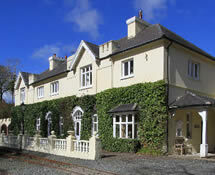 Built in the late 1800's, this unusual conversion is situated right by the Manx Steam Railway. With four double bedrooms, ensuite, dressing room, wet room, family bathroom, hall, study, drawing room, sitting room and dining kitchen, this unique property has plenty to offer. Outside is a double garage and good size gardens. Plus - the beach is just 10 minutes away.. This listing has been viewed 11920 times.